Every food-loving New Yorker has an intimate relationship with their local Chinese food joint. 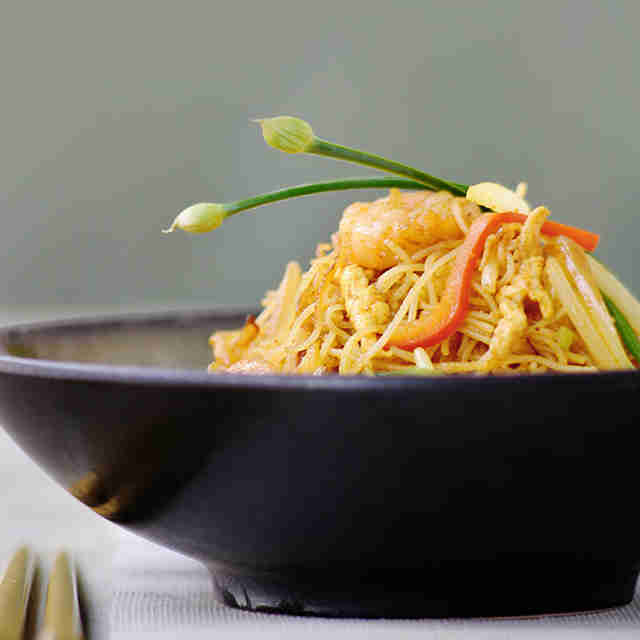 It’s the corner spot where you began an unlikely romance over quickly congealing chop suey. It’s the hole-in-the wall with the fortune cookie fortunes that always come true, in bed. It’s the delivery place where you tip extra because, even when the rest of the city seems to shut down, they’ll make sure you’re fed. Beyond your local takeout haunt, you’ll find truly remarkable Chinese food on nearly every block in the city. With Flushing’s unending stalls of authentic bites, Brooklyn’s late-night Far East mainstays, and the city’s innumerable dim sum havens, there is no shortage of options. Every now and then, it can be worthwhile to cheat on your reliable go-to. To help you narrow it down, we’ve rounded up the best Chinese food outside of, well, China. Consider it an open relationship. This sleek, minimalist restaurant from the team behind Midtown’s Michelin-starred Cafe China melds contemporary and traditional Chinese flavors to great effect. The unique menu boasts spicy, original dishes like pork and okra-stuffed egg rolls drizzled with chili oil, and tea-smoked duck with steamed buns alongside classic dim sum plates (including savory, indulgent pan-fried pork buns). Forget your no-frills dumpling counter -- La Salle’s cavernous dining room is appointed with high ceilings, plush, cushioned seats, and quick, attentive servers. The prices here are a bit steeper than your standard dumpling spot (a six-piece order of pork soup dumplings will set you back $9), but you get what you pay for. 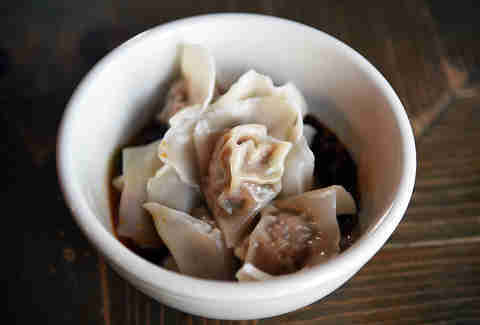 For all the food it has to offer, Bushwick is light on Chinese. Enter General Deb’s, Michelin-starred chef Kevin Adey’s popular Sichuan spot. Serving sustainably raised meat from Autumn Harvest Farm alongside offerings from the famed Sun Noodle, the place is a well-executed ode to provincial Chinese cuisine -- and it’s some of the best grub you’ll get in the area. This iconic Beijing street food-inspired hangout remains one of the cheapest options in the neighborhood. An order of four chive-and-pork dumplings will set you back just $2, and noted crowd favorites like the crispy sesame pancake sandwiches with pork, beef, or veggies each clock in at under $4. An outpost of the original Chinatown location, the Union Square iteration is just as reliably tasty -- and cheap -- as its forebearer. The eats at this 40-seat, fast-casual dining spot are entirely MSG-free. Without skimping on flavor, the kitchen dishes up steaming orders of glistening sesame chicken, tangerine beef, and slick rice noodles hidden beneath dense chunks of roast pork. In a neighborhood littered with Chinese takeout counters, Hunan Delight is one of the area’s few worthwhile sit-down venues for solid Cantonese dining. The contemporary decor mirrors an equally classic menu. 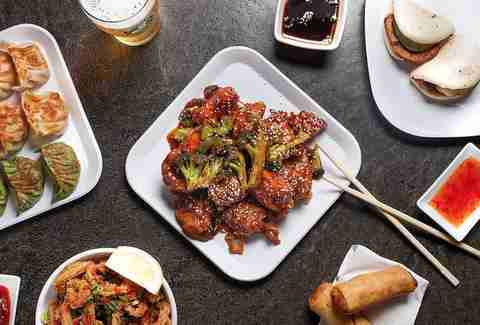 You don’t come here for inventive, contemporary eats -- you come for familiar plates of General Tso’s chicken and fried dumplings, served quick and hot. Tomorrow is a tiny spot with an even tinier menu hidden among FiDi’s skyscrapers. With just a smattering of tables, takeout is the move here. Grab three dishes for $10, or $4 a la carte options. 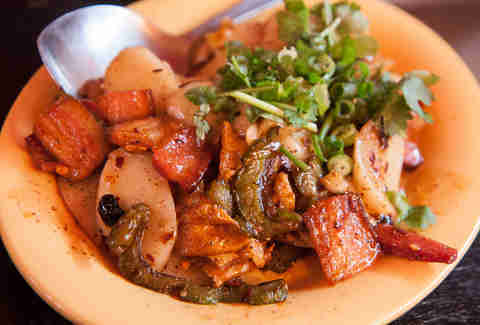 Try the spicy chicken with cucumber, fish fillet with ginger and scallion, and mapo tofu. Little Alley is an oasis of Shanghai cuisine in a neighborhood overrun with nondescript bars and the recent college grads who populate them. The move here is to order a bamboo basket of plump soup or pan-fried pork dumplings -- browned and crisp on the bottom -- followed by Little Alley’s Lion Head (minced pork, salted duck egg, sweet sauce, scallions) and the Shanghai stir-fried noodles: thick ribbons of dough swirled with shrimp, bits of pork, mushrooms, and bok choy. 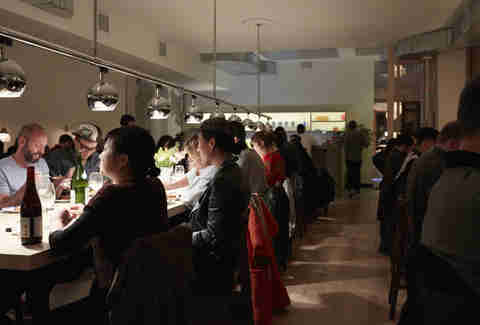 Chop Shop II boasts an array of modern pan-Asian dishes with influences from China, Thailand, and Vietnam. 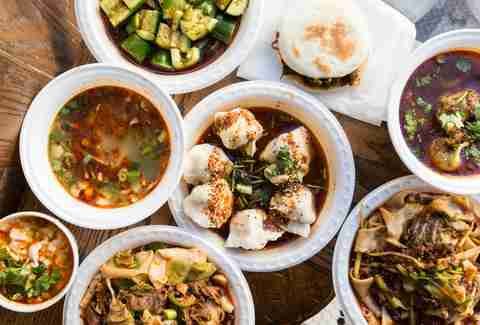 Small plates of steamed lamb dumplings or pork belly buns are good for a nosh, and and heartier items like the mapo tofu or spicy Thai fried bass will leave you satiated, not stuffed. Asian-inspired cocktails like the sojito (mizu shochu, lychee, lime, Thai basil, prosecco) offer a twist on old favorites. As the name suggests, you can expect supremely fresh hand-pulled noodles at this Brooklyn spot, which is also known for it's incredibly low prices (everything on the menu is under $10). Top your noodles with pork bone, lamb, beef tenderloin, or spare rib, then add on eight steamed or fried dumplings for just $4.75. If you’re the sort of person who enjoys watching fish dart around a tank before their distant relative ends up on your plate, this is your spot. And if you’re not, simply avert your eyes, because the seafood here is worth the guilt: Dive into entrees like the Pride of Lucky Eight with baby squid, abalone, dried scallions, and shiitake mushrooms, or the crab meat omelet. For beasts of land, lean into dishes like crispy suckling pig on rice or sweet and sour chicken. China + France = Chance. Get it? While this Smith Street restaurant labels itself as French-Chinese fusion, the menu divides and conquers; so you’re just as likely to find perfectly moist Peking duck as you are beautifully plated grilled pork chops and walnut-crusted brook trout. Don’t worry about choosing sides, though. The host, clad in black and French cuffs, will make you feel decidedly refined while housing down a mix of pan-fried, deep-fried, and steamed dumplings (and a chocolate souffle). Though the origins of NYC’s many Grand Sichuan restaurants are a bit murky, this Ninth Avenue inclusion has been a neighborhood staple for nearly two decades. Expect plenty of affordable plates like super-spicy Dan Dan noodles blanketed in dried peppercorns; sauteed duck with bitter melon; and Chengdu spicy dumplings. There are hundreds of Chinese food restaurants in New York, but few have been slinging dumplings since Woodrow Wilson was president. The oldest dim sum parlor in the city, this Chinatown eatery kept its old-school charm with a vintage façade and old-school booths. 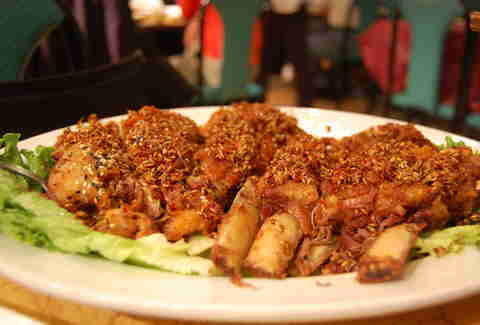 Use a pencil to choose dishes like fried sesame balls with lotus paste and a pan-fried dumpling platter. 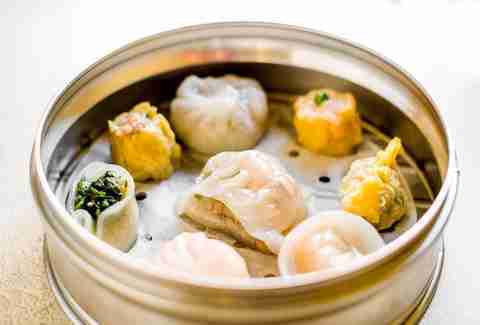 Save room and head over to Joe’s Shanghai after, for some of the borough's best crab or pork-filled soup dumplings. 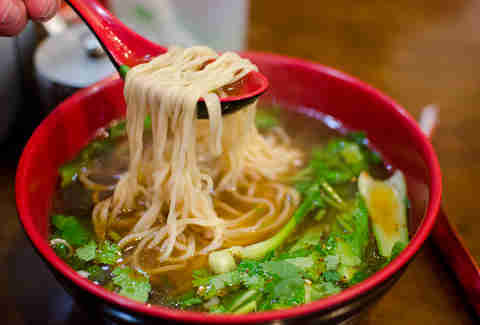 The homemade, tender wheat noodles alone make this bare-bones spot a must-visit. It's all about customization here: Choose from wide or flat noodles; then, pick from 25+ types of soup (beef tripe, pork bone, oxtail, eel, to name a few). You’ll want to make several return trips to nail your ideal combination. Since the 1970s, this no-frills takeout spot has been doling out very generous portions of comforting American-Chinese favorites like battered salted shrimp and roast pork fried rice. 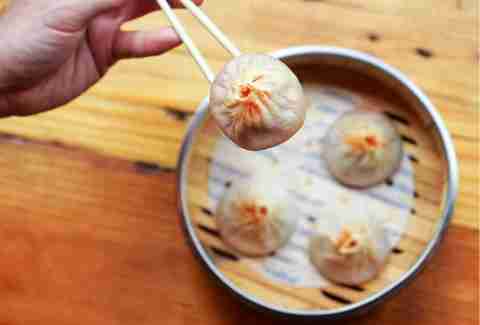 It's mainly about the the xiao long bao (soup dumplings) at this Shanghai-influenced restaurant, (go for the standard pork soup variety), but save room for inventive options like the you tiao and braised meatballs. You’ll face a serious wait at this popular Dyker Heights spot, but this is some of the best dim sum in Brooklyn. Once inside, carts stacked with roast duck and egg noodles will speed by, so be ready to make snap decisions. Don’t leave without trying the fried bean curd skin vegetable rolls and the chef’s famous goose intestine (it’s good, we promise). 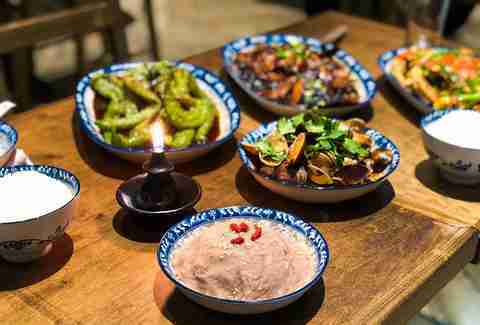 Visit the cozy Málà Project for their signature Sichuan dry pot. 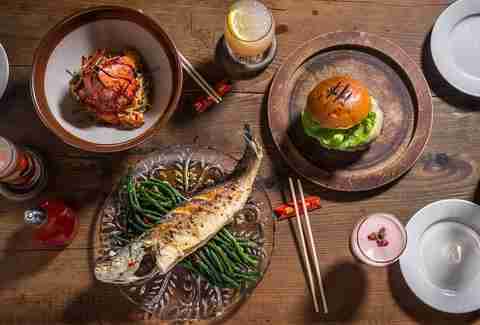 The menu is stacked with more than 50 ingredients, ranging from the innocuous (chicken thighs, snow peas) to the bold (rooster testicles, beef artery). Depending on the size of your party, you’ll choose at least eight items, which will be spiced mightily and tossed in a wok. After eating your way through all the dumplings Flushing has to offer, go to Fu Run for something you can't find everywhere else -- a taste of northern Chinese delicacies from Dongbei. Opt for the famed Muslim lamb chop -- a rack of braised, battered, and deep-fried ribs coated in cumin, dried chilies, and black and white sesame seeds. This Queens Boulevard standby is home to some of the city's best dim sum and authentic Cantonese fare, including fried rice balls stuffed with crab meat and country-style salt-baked chicken. 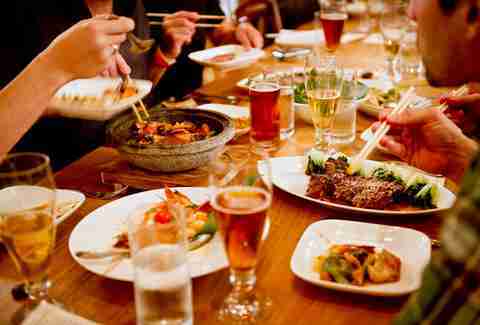 Your best bet here is to come with a big group of friends and order as much as you can. Xi’an got its start in a Flushing food court before opening 13 locations throughout the city, including this one on Manhattan Avenue. The chain is known for its spicy Western Chinese dishes, like hand-pulled noodles (be sure to try the spicy cumin lamb, aka N1) and easy-to-transport burgers overflowing with stewed meat -- all for crazy reasonable prices. Take the time to dine in. It may look more like a velvet-rope club than a Chinese restaurant, but the Cantonese chain, which has several locations worldwide including the Michelin-starred London flagship, offers Instagram-worthy plates like stir-fried Brazilian lobster tail, roasted silver cod with Champagne and Chinese honey, stir-fried black pepper rib-eye with merlot, and a black truffle and roasted duck bun. After getting its start in San Francisco, Danny Bowien's buzzy Chinese restaurant made its way to a tiny space on Orchard Street, before moving to a much more spacious venue on East Broadway. 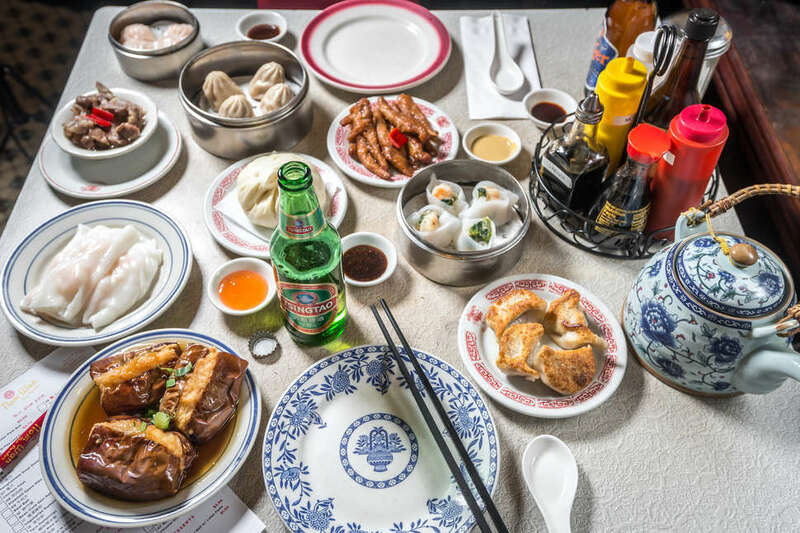 This LES/Chinatown spot is known for its modern and inventive Chinese food, like kung pao pastrami and salt cod fried rice. It may not be the OG, but the Midtown offshoot of Chinatown’s Peking Duck House is just as worthy of the restaurant's bold name. Dressed-up waiters bring the whole made-for-sharing shebang to your table, slice it before your eyes, and let you fold the succulent meat into house-made pancakes swiped with hoisin sauce, scallions, and cucumbers. With offbeat (and affordable) options you can't find at every other Chinese spot in the city -- like camphor tea-smoked duck -- it’s worth braving the Midtown lunch madness for Szechuan Gourmet. Other musts include spicy prawns with asparagus and chili minced pork with dan dan noodles. 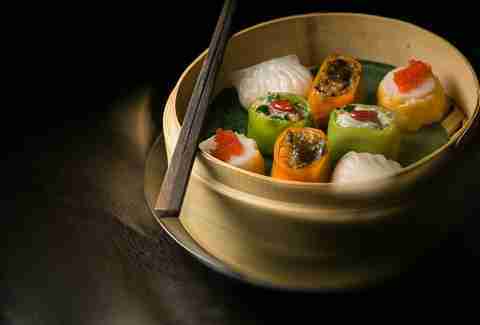 With more than 100 menu items, even the pickiest eaters will find something to sample at this grandly appointed Cantonese dim sum hall. Here, you’ll have the chance to pluck bamboo steamers of jiggly soup dumplings and pink pleated har gow off waiter-wheeled carts. For those on the opposite end of the palate spectrum, you probably don’t need to worry about Pacificana running out of cold marinated chicken feet with jellyfish during dim sum hours. The sunny, spacious, second-story dining room is excellent for a weekend brunch, but arrive early or gird yourself for a wait. The folks behind Employees Only prove they're good at more than just cocktails at this Chinese-meets-Portuguese spot, which boasts a menu full of things like Macanese lobster noodles with a chili beurre blanc and African chicken with piri piri, ginger sesame slaw, and peanut curry sauce. Obviously, the drinks aren't overlooked here either, and special attention should be paid to the Drunken Dragon’s Milk (green tea vodka mixed with coconut puree, Thai basil, and Macao five-spice bitters). Established in 1938, this hidden Cantonese gem -- which is open 24 hours! -- offers plenty of the usual stalwarts (egg drop soup, sesame chicken, chow mein) but the best move is to opt for the chicken with oyster sauce and fried pork chops with salt and pepper, which feed late-night hunger like nothing else. Upper East Siders swear by the pork-forward Pig Heaven, home to plenty of porcine specialities (pork buns, shredded pork Peking style, moo shu pork and pancakes), as well as a laundry list of other Cantonese and Sichuan dishes: spring rolls, shrimp with lobster sauce, and chow fun. Things are certainly dressed up here (namely, the waitstaff and decor) but there's a reason UWS residents have been flocking here for Sunday night dinner since 1981 -- a wide variety of regional Chinese dishes, from flavorful Cantonese wonton soup, to rack of lamb Szechuan-style, to Chicken With Three Different Nuts. The claim to fame at this West Village restaurant is the Katz’s (yes, as in that Katz’s) pastrami egg rolls, but the sauteed lobster, black bass tarts, and bacon-laced fried rice are equally satisfying. Rustic communal tables and red gingham seats make for a fun, social vibe, so be sure to dine in for the ultimate experience. This is also a two-for-one: Located right downstairs is Decoy, from the same team, offering bird-focused eats like succulent peking duck and a duck & kimchee flatbread sandwich.